Toon's Tunes : Marillion, three weekends, seven photographers, a million flashes of inspiration, and one book. Coming soon. 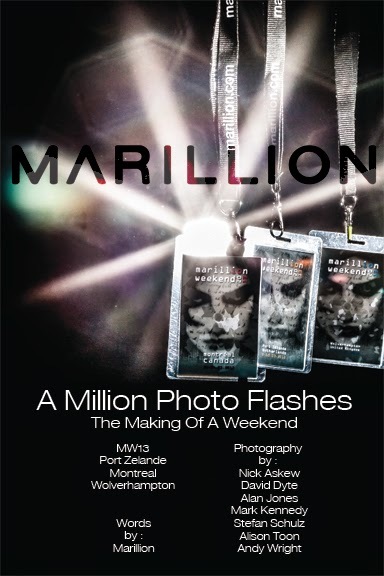 Marillion, three weekends, seven photographers, a million flashes of inspiration, and one book. Coming soon. And it's all about the music, the musicians and performers, the lights... because all the photographer does is catches a flash of the light shining from the sound and soul on the stage. This book shares quite a few such moments from three wonderful weekends of music, headlined by Marillion, enjoyed by fans who travel from around the world to participate. The 2015 Marillion weekends are coming soon... will you be there? Can you guess how many photos seven photographers can take during three weekends of their favourite band's shows? I guess you'll just have to buy the book to find out! On sale at all three weekends, and then online later this year. Get your copy of this book at one of the weekends... I'll be at PZ and Wolverhampton. See you there!